The variety of trees, plants and shrubs we see in the Japanese garden is most of the time limited. Quite often we see a Japanese garden design composed with only a few different plant species and tree families. Most of the time this limited selection of plants and trees does not hurt the overall scene. To the contrary, smaller number of colors and textures unifies the palette of color and can create the typical harmony in the Japanese garden. The key to a great Japanese garden lies in the design and the combination of flowers, plants and trees the Japanese gardener had in mind when building the garden instead of the variety. Pruning and garden layout are generally considered far more important than plant selection. 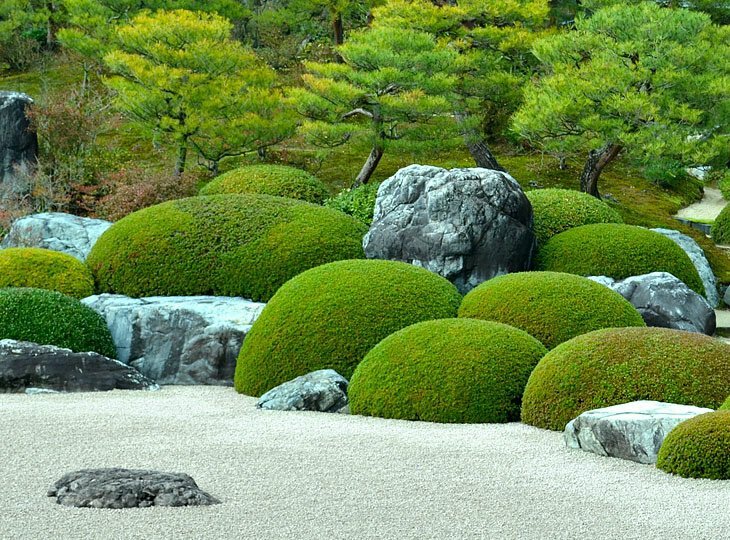 The majority of plants used in the Japanese garden are evergreen trees, shrubs and plants. The reason for this choice for evergreen foliage lies in the the goal to create garden that is beautiful all year around. Most of the evergreen shrubs are taxus trees, clipped in round shapes to mimick far away hills. While Japanese gardens are not known for their flowers, they do use flowering trees and shrubs. Azaleas or rhododendron in particular, are common and seen in nearly every garden in Japan. Also one of the most beautiful flowers is the Wisteria floribunda. This is a flowering plant in the pea family Fabaceae and native to Japan. Growing to 9 m, it is a woody, deciduous twining climber. Some, but not all, Japanese gardens display plants that may feel somewhat exotic to Westerners. These would include bamboo, moss, and carefully-pruned pine trees. All together, a wide variety of choices for the gardener to "paint" the garden with. Yokoso Japanese Gardens can assist you in choosing the right trees and plants for your Japanese garden. Most of our trees, taxus and azaleas are directly imported from Japan ensuring the very best quality and value for your money. Please use our contact form. Provide a clear description of the desired product and a reference to a picture on the internet and we will try to find the product for you.